When I first started buying preloved and vintage luxury clothes I kept it pretty quiet. Sustainable style had not yet become a la moda. In Australia at that time, the view was only people who couldn’t afford to buy new bought secondhand garments. This view has shifted significantly over the last 5 years. We have become a society focused on reusing and recycling to limit our waste. When we think about consumer waste we think of old computers and fridges, items made of plastic which are not bio degradable. Right? But in reality, fashion waste is a massive problem! Not only in manufacturing but also in disposal, and this is due to the rise of fast cheap fashion. We all know the vicious cycle – we buy on trend, maybe wear it once or twice, and at the beginning of the same season the following year, we are throwing out a pile of dated, barely worn or new, clothes. I was as guilty as the next fast fashion lady. But, I hated it. It was expensive. It was wasteful. It made me mistrust my own judgement. It was a heaped pile of bad decisions staring me in the face every 6-months. So I made the conscious choice to change the way I dressed and the way I shop. While I now have a wardrobe wall-to-wall of luxury brands, my overall fashion spend is actually less. I don’t discard pieces unless it is worn out. Why? Because I abandoned shopping ‘on trend’. I became methodical in my style acquisition. I stopped buying things just for the thrill of buying new. This revelation got me really thinking about my fashion footprint. I am, after all, a self-confessed nerd! I decided to peep behind the curtains of fashion manufacturing and disposal and let the environmental and human costs of fashion inform my style choices. This is not me being a hippy; this is me being a clever minded economist. When we buy a garment in the shops, we NEVER pay the full price of that garment. The ticket price does not take into account the human and environmental cost of that item being produced. Fashion would be much more expensive if the ticketed price included all seamstresses being paid fairly and fashion waste being properly disposed. I highly recommend you watch ‘The True Cost’ or ‘Out of Fashion’. These documentaries highlight the unseen costs of fashion manufacturing and makes for honest, brutal viewing. Given we are mostly in the habit of buying the end product without thinking where it came from, the documentaries give us some visibility to the process. I can’t vouch for their statistics, but you get the idea. The figures in Australia alone are staggering. Here are a few statistics on fashion as published in a recent Australian ABC article. Polyester and other synthetic fabrics take 200 years to break down in landfill. Terrifying isn’t it? We all try to assuage our guilt by dropping our clothes off at the local Good Sammies, but most of those clothes are no longer wearable and end up donated to Australian landfill. It comes down to simple market economics. We reduce fashion manufacturing waste by reducing the demand for new clothes. If we buy more preloved and vintage fashion, we reduce disposal waste. Simple. This is not to say buy every garment preloved. Trust me, I will always buy my knickers new. But we will go a long way to reducing our fashion footprint if we get ourselves to a point of buying 50% preloved and 50% new. Or a better way to look at it this… You can help the environment and look super chic doing it in head-to-toe vintage luxury designers. Now that is a version of environmentalism I can very easily embrace. How do you shop sustainably? Many purchasing choices apply equally to buying new and preloved fashion. Here are some pointers to navigate the sustainable style landscape. Consider your lifestyle. Only buy things you will actually use. Don’t just buy something because it’s on trend or you saw a celebrity wearing it. Read the labels. Stick to natural fibres where possible – wool, cotton, silk and cashmere are your friends. They are not made from crude oil and will decompose naturally. Don’t over-shop. Don’t buy things just because the price is appealing. Be discerning and not impulsive. Learn to play the long game. Shopping preloved is a jog not a sprint. 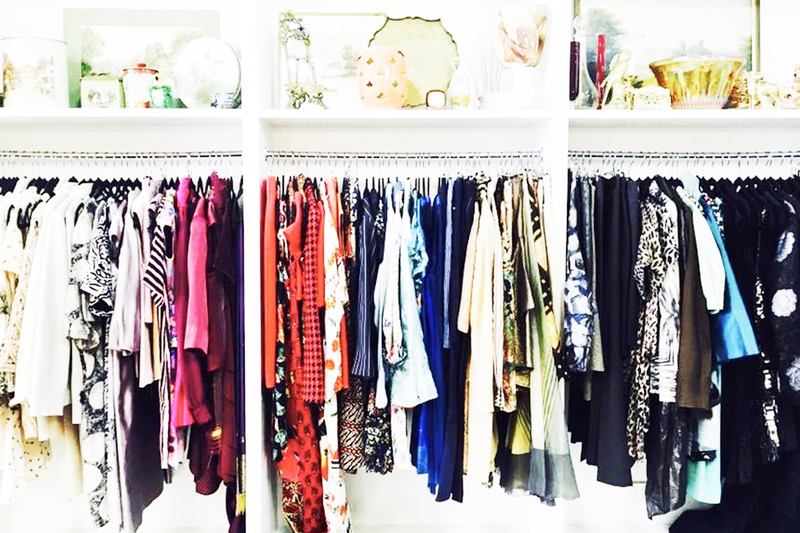 A preloved shop won’t have the same item in a range of sizes or colours. Make a list of bookmarks. On your smartphone or internet app and make a habit of having a scroll through the ‘new arrivals’ of your favourite preloved shopping sites several times a week. Do it while you are on the bus or the treadmill. Know your measurements. This makes preloved shopping much easier. Some sites list the garment measurements. If they don’t, message them and ask for the details. Cuts and styles change over the years. Many sites also offer free returns, but why do to the hassle of returning when you can be more discerning at the buying stage. You don’t want a wardrobe full of things that don’t fit properly. Do some research. READ THE TAGS. Learn which manufacturers are sustainable or fair trade. Chances are if an item is made in Bangladesh, the garment may come from sweat shops housing underpaid workers with denim blue water being pumped into the local river. Sell clothes you no longer use. Take good condition garments to your local consignment store or sell them at the markets. Give someone else the opportunity to treasure it, with the added bonus you may make a bit of money back. You may be thinking “I don’t have the time or this” or “this all sounds too hard”. Most preloved sites are online so it is more accessible than you think. And… we are on our phone all the time! Once you learn the ropes and make a habit of it, shopping pre-loved becomes second nature. Sometimes you will find a treasure , sometimes you won’t. Don’t be disheartened, it takes a bit of time but it is worth it to enjoy the rewards later down the track. The daily luxe will have more coming shortly on some of the best pre-loved luxury sites to buy from.